Is the rest of the clutch installed? If not your going to push that cylinder so far it will start to leak. The throw out bearing and bellhousing that are out the othe car. I read that it is easier to bleed outside the car prior to engine install. Should bleeding be done after engine is bolted up in place only? I get about an 1/8 of an inch of travel before the plastic tabs pop off on one side and then it begins leaking. Any advice is helpful. Thanks! If it starts to leak after 1/8" of travel, I'd say its pooched. I thought you might be over extending it and blowing the seal. 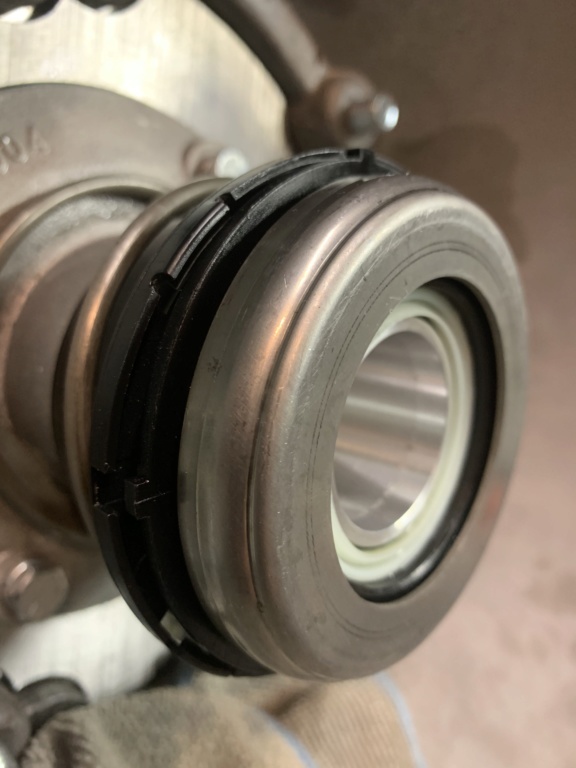 when its sitting as pictured the cylinder is at the end of its travel, if you put any hydraulic pressure to it the retainer will come off and you overtravel the cylinder, and the end result is its junk. the bearing is pushed in when its all bolted to the engine. That sadly makes sense. Can I assume that the bleeding should be done installed in the car which would avoid the over extension issue??? Chalk one more up in the live and learn column. Thank you for the insights! You could probably bleed it by hand by pulling the bearing in and out. Using the clutch pedal though would cause the bearing to over travel and blow the seal.